It’s easy to set a local image or photo as wallpaper in Android. With the help of third-party apps, you can even customize the way how your wallpaper appears on your tablet or phone. You can set live wallpapers, rotating wallpapers, multiple home screen wallpapers and so on. Speaking of which, what if you want to automatically set the photo that you last “liked” on Instagram as your device wallpaper? This would be a pretty cool option especially if you’re always using Instagram to discover new and interesting photos. Well, worry not for there’s a way for you to make this possible. Just follow the instructions listed in this post. First, you must create an IFTTT account. If you already have one, make sure to enable your channel for Instagram . Next, click here  to view the “Set Android Wallpaper to latest photo liked on Instagram” recipe on IFTTT and then click “Add”. Once your new recipe has been created, click “Done” to proceed. Once done, download  and install the “IF by IFTTT” app on your Android device. This will enable you to link your Android device to your IFTTT account. Next, open your Instagram app and then “like” any photo that you want. It may be a photo from your own profile or a photo from another user. After which, open the IF by IFTTT app on your device and then go to your recipe list. Select your recipe for “Set Android Wallpaper to latest photo liked on Instagram” and then tap “Check Now”. That’s it. 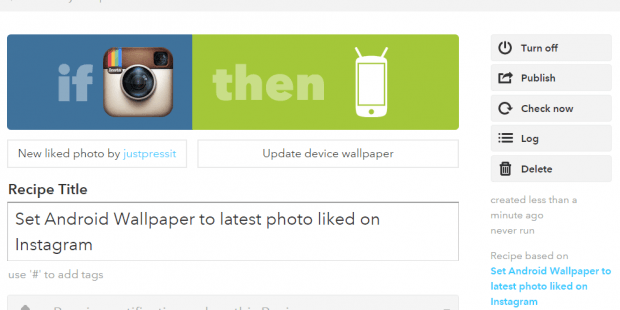 The app will automatically update your Android device wallpaper based on the photo that you’ve last liked on Instagram.